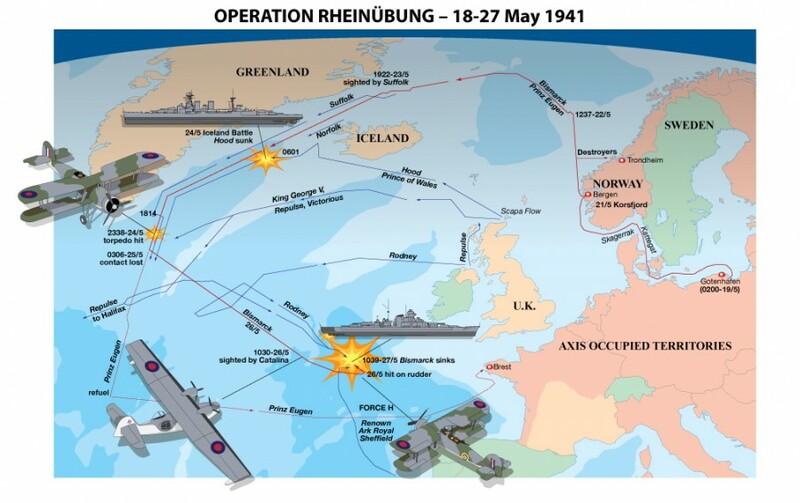 Map of Operation Rheinübung–a sortie carried out by the new German battleship Bismarck and the heavy cruiser Priz Eugen, with the intention of blocking Allied convoys. Thanks to the work of the late Jane Fawcett (a cryptographer at Bletchley Park), decoded Enigma messages revealed the Bismarck’s current position and heading on 25th May 1941. Two days later and after suffering some 400 direct hits, she was sunk. Of a crew of over 2,200 men, only 114 survived.